In late 2013, I got the opportunity to join the BBC Natural History Unit (NHU) to help film two segments for their mini-series called “Wonders of the Monsoon”. 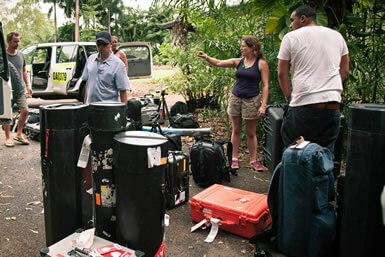 The first segment was to be shot in the Angkor Wat area of Cambodia during the wet season, the second segment was to be shot in the Northern Territory (aka the outback) of Australia during high thunderstorm season. 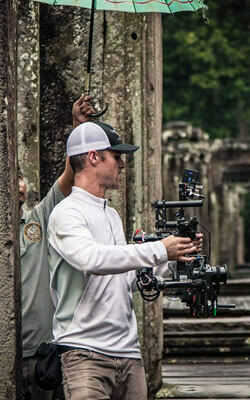 There were numerous challenges to deal with on these shoots – extremely wet weather, ultra high humidity, dense jungle hikes to carry gear through, hanging out of a helicopter for aerials in the outback, complex MōVI rope systems in the Cambodia jungle ruins, and more. In this post, I’m going to talk about how our team dealt with these challenges, what worked, what didn’t, and throw out some ideas that might help you on your next big MōVI adventure shoot. Ok, the title of the series has the word “monsoon” in it. We knew there would be rain and generally speaking, electronics hate water. Our plan was more or less this – have a guy with a huge umbrella follow me around, carry lots of towels, have the back-up MōVI ready to go in case the umbrella / towel system fails. The Freefly Systems engineers had reassured me that the MōVI is actually pretty nicely sealed up internally, so a bit of rain didn’t seem like it would be a problem. And to all our surprise, we did not run into one water-related issue with the MōVI or any other peripheral gear, and every piece of my kit got at least a little wet at some point in the shoot. I’m not suggesting in any way that you should not protect your MōVI setup from water – in fact, I did have a MōVI break on me on a later shoot, due to a great deal of water being shot all over the MōVI unexpectedly – but I will say that the system can deal with a surprising amount of water falling / splashing on it before it becomes a problem. Once it is a problem though, game is over for a while, so protect your gear from water as best as you can and avoid a game stopper. I’ve come up with some nice ways to protect the MōVI system from rain on later shoots which I’ll go over thoroughly in future posts, so keep on the lookout for that. • For best results, you need to take the door off the side of the helicopter to increase your shooting options. Make sure you work this out with your pilot before you book, not all pilots will allow you to do this. You will also need to make sure you have a proper harness that will keep you from falling out of the helicopter to a terrible death. You also need to put some sort of a safety line on your MōVI so that if somehow it slips out of your hands, it does not fall from the helicopter, break into a million pieces, and / or injure someone or something below. For super amazing results, get out of the helicopter cabin and onto the skid. This will allow you to get into all sorts of interesting vantage points and positions. 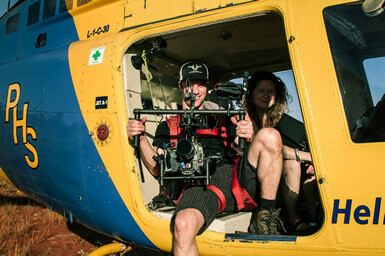 • You probably need a second MōVI operator in the helicopter cabin to control pan and tilt and focus. Using majestic mode (single operator mode) while hanging out of a helicopter is very difficult if you want to get precise framing. And trying to manage focus accurately on your own as well? Forget it. Find a second operator and get it done right. • Keep your speed to 40 mph or slower, or the wind resistance will likely shut the MōVI off. If too much resistance is put on the MōVI motors, it spikes the power draw and the system shuts down to protect itself from damage. I’ve found that this happens at right about 40 mph. For faster shooting conditions, tuck into the cabin and get out of the wind channel. It greatly reduces your shooting options, but you can still get some nice profile shots of the landscape. • Make sure your MōVI is set to “Motion Boot” in your Freefly app. This allows you to power the MōVI on while it’s in motion. If you don’t have this option turned on and your MōVI accidentally gets shut off or needs to be rebooted, you will have to land the helicopter to restart your MōVI which is a huge pain. • While shooting, do not rest your elbows on your knees. Yes, it will become increasingly difficult and eventually painful to keep your heavy rig suspended in the air (did you really need to add an iris motor and shoot on Master Primes? ), but remember – the MōVI does not stabilize vertical translation. So any small bounces or vibrations that pass through the helicopter – and there will be lots – will pass right through your knees and into the camera, greatly reducing the smoothness of your shot. Eat a protein bar, get zen, grind it out. Bungee cords, EasyRig, all those options may be worth it if your arms can’t take it, but the footage will be less smooth, guaranteed. Complex rope rigging for the MōVI is a long discussion and the length of this post is already getting way out of hand, so I’m not going to go into too much detail here – I will save that for another post, as there is a lot of ground to cover. So to put it simply, hanging a MōVI from a rope creates so many insane shooting opportunities, it is mind boggling. With just a few pieces of gear – rope, a few carabiners, a pulley – you can create camera motion similar to jibs, lifts, lowers, cable cams, spider cams, plus all sorts of amazing, new moves. You need to know how to tie a good knot, how to find good anchors, sometimes be good at climbing things like trees, but most importantly think carefully and critically about the forces at play on the camera and the MōVI system before letting it swing free, or you could be headed for disaster. A good way to understand on a basic level what you can do with the MōVI and rope systems is to watch this behind-the-scenes video I put together from this project. It’ll get you started thinking about just a few of the many possibilities. Enjoy the videos and check back for more posts soon – lots more MōVI Operator information to cover!